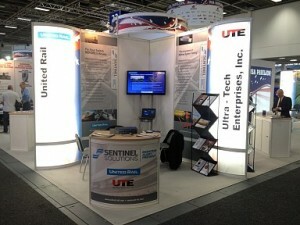 United Rail first time exhibited at the Innotrans in Berlin, Germany. The Innotrans is the worldwide largest rail technology trade show. United Rail joined the USA Pavillion in Hall 22. We had very successful meetings and lots of international customers at our booth. For the Innotrans we shared our booth with Ultra Tech Enterprises, Inc. our partner for the development of the Sentinel Solutions.